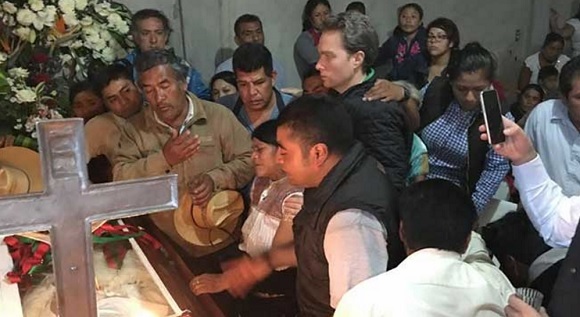 The governor of Chiapas, Manuel Velasco Coello, traveled to the municipality of San Juan Chamula to attend the funeral of Mayor Domingo Lopez, who was killed by unidentified armed men on Saturday July 23. Velasco made the trip to Yitic rural community, located approximatelly 40 minutes away from San Juan Chamula’s municipal seat to give his condolences to the family and friends of Domingo Lopez. In this bordering town Chenalhó, the Chiapas governor regretted the tragic events of last Saturday July 23. The governor stated that a few hours before, a commission was set up to reach a peace agreement in San Juan Chamula with the will of the people and 168 communities in the municipality. 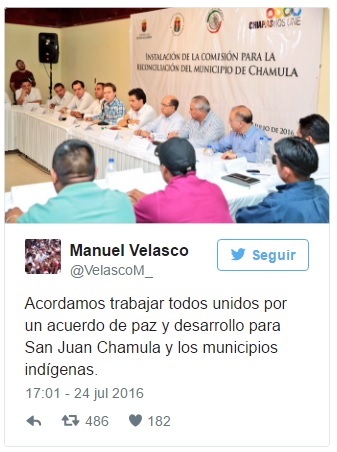 On Saturday July 24, Governor Manuel Velasco posted on his twitter account: “State and municipal authorities need to work together to reach a peaceful agreement for San Juan Chamula and the indigenous municipalities around it”.